Hi Ren, Sharon and regular visitors. I did mention in my first post that I’d update you on first impressions and a ride report but since that happened back in March I've missed that slot. So here we are with a thousand miles under the wheels and 7 months later. 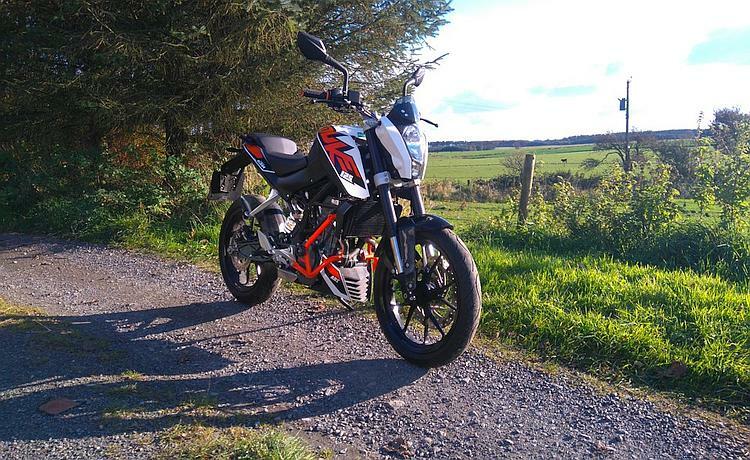 This isn't so much a review of the KTM 125 Duke, it's more about living with it and what I like and don’t like and what it’s given me. I bought the Duke back in early November last year and immediately had to put it away because it was too cold to ride. That opportunity came when the temperature reached double figures and I've been riding it whenever I can since. I have a nice 2 piece textile suit but no matter how well I wrap up I don’t seem to be able to get past that barrier. It’s a common symptom of the condition apparently and 4 years in I'm still trying to get my head around such things. It was chosen purely on the fact of the extra 4 hp and 6 speed gearbox over the Honda CBF, thinking there would be a big enough difference between them to justify the price. There is no doubt that the spec and quality are better, in fact I think MCN got it about right when they said “It’s a proper bike that just happens to be a 125.” But there’s no escaping the fact that it is a 125. 6th gear is an overdrive and it’s the first gear you drop when turning the corner and heading into the wind or an incline. That said it’s not the bike at fault just my expectations. The looks as well didn't do it for me either although today I think it looks good, so it’s growing on me. I definitely bought the right bike though, the riding experience is something else and that’s the reason I've warmed to it. It’s certainly very stable on the road and inspires confidence especially in the bends. I must be doing something right because I can leave the traffic behind in the bends which is the way it should be. Saying that the front tyre is bigger than most of the rear tyres fitted to the back wheels of the bikes I used to ride back in the 80’s. It is fitted with ABS for which I'm glad about although it’s never kicked in and it is switchable on and off. Nice wide bars which were immediately comfortable coming from riding dual purpose bikes for the last 14 years. I changed the grips though as many owners have done due to them being a very hard compound. Crash bars were already fitted when I got it and are a sensible accessory anyway so they can stay. I’d like to get a radiator guard and shock absorber cover which I’ll sort for next year. SW Motech do some very nice soft panniers and fixing kit, Givi have a tank bag I'm looking at but that’s about as much stuff I’d like to add to it. Back to the riding experience because this is where it really scores high in my books. The foot pegs to seat and handle bar position is very comfortable straight out of the box for me, slightly perched forward it gives the rider a sporty stance although you’re still upright enough that there’s no pressure on the wrists at all. I've done 90 odd miles in one go without suffering any stiffness or fatigue. I've settled into life in the slow lane very happily, which is quite strange in itself because I didn't travel any faster on the other bikes I've had. I go everywhere between 30-55mph, it must be the fact that there was extra in my right hand if I wanted it. You’ll notice that the exhaust finishes in front of the back wheel so that’s what you hear when travelling along. I've never been one for loud pipes since they can really spoil the journey. There’s enough noise to let you know what’s going on underneath you but not enough to disturb your thoughts and it’s standard. I've watched too many videos with after market exhausts fitted and the throttle pinned wide open, 5-7 seconds later the engine has finally caught up and then they do it all again in the next gear. If you ride it as it should be ridden with keeping the throttle slightly ahead of the engine on acceleration, listening to the music from the exhaust, you could be forgiven for thinking you’re on a bigger bike. Just don’t look at the speedo, you sound like you’re travelling much faster. Anywhere between 4-7000rpm is where I seem to spend most of my time with 8000rpm giving 60mph. As you've probably guessed I really like the sound. There’s also a decent amount of engine braking which means I can ride it on the engine and gearbox, only using the brakes to stop. It’s a full size bike as well and that helps. Earlier in the year I was down in Surrey and took the Yamaha MT 125 out from a local dealer. I prefer the looks of the MT over the KTM but after about 30 miles and 45 minutes later I was glad to be back outside the dealer with it. I found it really uncomfortable and was in quite a bit of pain. That could have been an expensive mistake if I hadn't taken one out. It’s one of the drawbacks of living out in the sticks. My nearest dealer is 50 miles away and that’s fine if you want a Honda. There’s nothing else here. I am looking at a second bike for next year, probably a YBR or CB but that will be in the second hand market because it’s home servicing once it’s here. When I’m not riding I like to clean and maintain them. As long as I'm doing something bike related then I'm happy. Apparently it’s got the same dash as the RC8R, what that does for me I'm not sure. Thankfully the important numbers are the big ones. There’s an awful lot of information in there. This is just one of half a dozen possible displays, there are 11 pages of the handbook devoted to the dashboard. Far too much for my liking. On top of that you've then got 4 warnings, low fuel / low battery / side stand down and high coolant temp. Low fuel then switches to a count down of the mileage for what you've got left in the tank. If my maths is correct what’s on display reads 128mpg. I've no reason to doubt it as I've checked it with litres at the garage and a calculator. Probably tells you more about me than the bike. It is a better bike but I don’t ask anymore of the KTM than I did of the CBF. Expectations again, back in the real world with what we actually need and use a bike for I guess. Oh on the top you’ll notice you've got shift rpm, that’s a very bright white LED that blinks at you catching your eye and telling you it’s time to pick the next gear. I've moved that well up the rev range out of the way. Don’t stare at it because that’s your night vision gone. Must be the reason they put illuminated switch gear on it as well. Who needs that! It’s a very expensive bike but saying that KTM make it very easy to own one with 0% finance and a low deposit, some dealers are offering all the riding kit as well. The only way I justify it is I bought it second hand after looking at various sites over a period of time for that low mileage, one owner and fsh. Personally I wouldn’t buy a new one for the simple fact of the warranty period and servicing or lack of in this area, but then I'm not a 17 year old either. I'm a 50 year old disabled motorcyclist trying to make the best of a bad situation. All in all I'm very happy with it and shall be hanging on to it regardless of the other bikes that will come and go. The weather isn't looking too bad this week so I’ll get another couple of runs in this year before I have to put it away. Next year I’d like to double the mileage and try and get camping again, but I don’t want to do that alone, at least not to begin with. So I'm in a pretty good place really, plenty to be getting on with and plans for the future. Oh and I’d like to actually go on a decent journey and do a trip report. I'm still very enthusiastic about 125’s and it seems that pace of life suits me well. So I'm pleased to report all good news. Well I hope you enjoyed the write up, and for those of you that continue to use your bikes all year round ride safe. Loved reading your update thank you. So glad you and the KTM are getting along nicely. It is good to hear that it has enthused you with the desire to get out even more next year and maybe even go camping. I least you have luggage options on the KTM which is more than can be said for my Kawasaki Z250SL. But where there is a will there is within reason a way. The fact you can state you bought the right bike for you is all that matters in the end. I myself am still not 100% certain I can say that. Only for the simple reason that I miscalculated how low the bike would be after being lowered. Therefore not being able to flat foot is still a bug bear with me. Other than that I too am loving my new bike. Lovely pic of your bike by the way I personally think they are a nice looking bike. Hi Sharon, thank you and yes I was glad to read your getting to grips with yours. I found it funny that we're both gaining confidence but from opposite sides. My 30 odd years of biking seems to stand for very little. As far as getting your feet flat it's something that never bothered me. The NX650 had a seat height of 890 and I could only put my toes down on one foot. You'll get there I'm sure. After market accessory company's will catch up, It's the drawback of a new model as you well know now. I thought SL was putting a solution together and that might be better than anything off the shelf. Well keep heading in the right direction and keep posting. An enjoyable read. I think the KTM is a good looking bike and hear the phrase "they inspire confidence" all the time! The important thing however, is that you are still in the saddle and enjoying riding. Ren and Sharon are good ambassadors for the smaller engined bike. They have a fantastic time out and about! If it wasn't for my height requiring a larger frame I'd be sold on the idea. I think you'd look most splendid on an MSX125 Grom Drew. In case anyone reading doesn't know, Drew's about 6 feet 7 inches tall. He'd look like he was on a bicycle for 5 year old children. Hi Drew, thank you for your comment. Yep all good, there's a couple of accessories to buy over winter and a service to perform but I'm looking forward to the riding season next year. Although I have a full licence and still ride any bike and do, it's purely a weight issue with me. So not even all the 125's are open to me. What Ren and Sharon were doing with their bikes was the reason I was drawn to this site. I hope next year to add a couple of trip reports myself. That's the sort of inspiration I've got from it. Tony - try Damart thermal underwear, it's brilliant. Sharron - try a pair of Daytona Lady Star GTX boots They have a 6cm heel hidden in the boot, which allows my 5'3"(1m60) daughter to ride an old Honda CB1 400 and get both feet flat on the groumd. Glad you are enjoying our site and thanks for your advise. I already own a pair of Daytona Lady Star boots. Fantastic boots. Expensive but worth it. Not only for the extra height they give but the sheer quality. I bought mine second hand so no idea how old they were or what mileage they had done before I got them. But I have them 3 years now and but over 20 thousnad miles on them. They have been through some extreme weather and have yet to let me down. 100% warm and waterproof. Could not recommend them highly enough. I really must get around to doing a review on them. Pfft too much to write that never gets done because I spend too much time spent on my bike :-). I hope to travel to Germany soon on my bike so any tips on best places to go etc would be very gratefully received if you can spare the time. I hope you're still enjoying your KTM Duke. I'd wondered about buying a CB125F (where I live the only dealer nearby is Honda too - you're not near Stratford upon Avon are you ?) - hence arriving at Ren and Sharon's site a few week's ago. But as a sort-of returning-but-didn't-pass-test back then, heavy 50-somethinger I felt need for a bit more 'go' in a 125 having done CBT on a Yamaha YS 125 (I think). It wouldn't pull me along at much more than 50. Doing a stretch of dual carriageway on the CBT day I felt a bit vulnerable at the time. And I didn't like the (look of) YS' thin tyres ! I bought a Duke because of all the reasons you've mentioned - and was considering an MT, but I viewed the Duke first and was smitten straight away ! A couple of weeks on, with (thankfully) some reasonable weather (April 2018), I've been out and about a few times and have really, really enjoyed it. 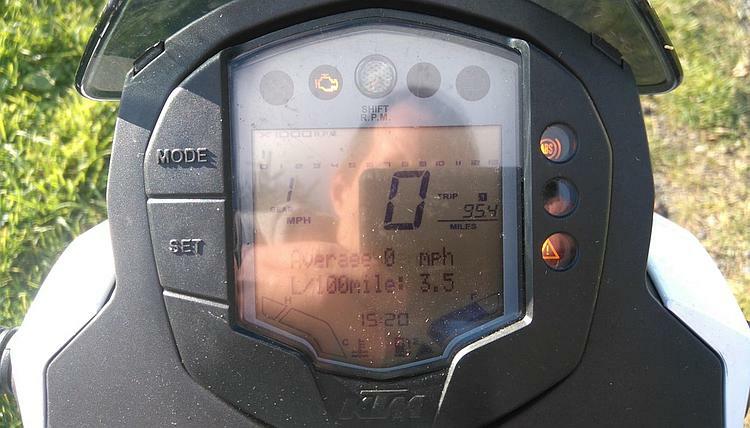 I think, this time around (as a learner biker), I'm really appreciating many of the things you're also saying - engine braking is a good one - around wind-y country lanes it's just gears and throttle (as you say engine braking seems quite capable) and it seems to handle really well, but I'm no knee-downer. I'm still running in, so don't want to wind it up above high 40mphs anyway, but apart from one long-ish run I've not really felt need to go a great deal faster as it's turned out. As confidence increases and rings bed into cylinder wall I probably will want a little more out of it, but it is certainly paying its way in 'smiles per hour' so far. Really enjoyed reading a review by a 'real' person (and not a journo). Thank you. I'm glad you're enjoying the KTM. I've not had the opportunity to ride one myself, shame really and since The Rocket Centre in Blackburn closed we've no dealers around here to get a test ride. I'm sorry to report that Tony who wrote the article died from lung cancer last year. I received a short message from his wife and while we barely knew him it touched Sharon and I. So I tip my hat to Tony, thank him for his contribution and I'm glad his Duke put a smile on his face. Now that's a proper pair of bikes Jammy. 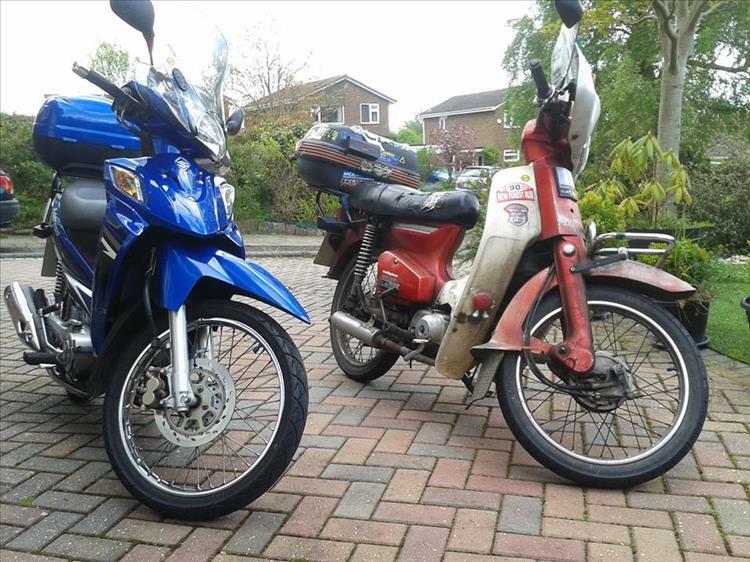 The FL125 is not a bike we see much here in the UK - what's your experience with it been like? It looks very much akin to the ANF125. I love it, good mix of performance and economy, does a huge 174 mpg on my commute, closer to 150mpg at A road speeds (regularly do 200 mile round trips to Torquay visiting mum) and lowest was 90mpg! That was a 60 mile test throttle pinned up the motorway against a friends c70 (with home made 148cc engine fitted). The fuel gauge lies though, don't fill up when it says empty because it ain't! The only thing I'm unsure of is it has an oxygen censor fitted halfway down the exhaust pipe, and would like to put a louder pipe on it. Bits are a bit pricey compared to the in anf but service is only plug/air filter/oil filter. And the leg shields are more style than substance, cannot keep the cold/rain off like the cubs. I also put it away when they start gritting the roads and just use the cub daily. Why do you think you need a louder pipe? Small singles do sound nice with a louder pipe, my cub has a home made one and you can see car drivers notice it when i'm filtering through the traffic...its not silly loud, just enough. Yes, they probably do notice it. And what do they think? I leave others to answer that.